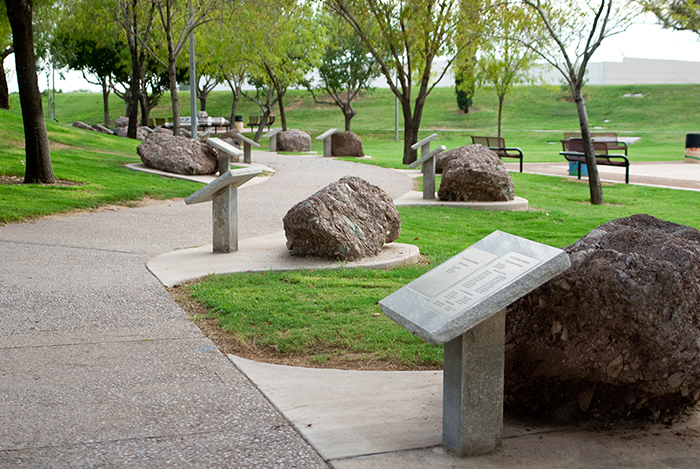 Enjoy a lush oasis of topiaries and commemorative plaques located in Kiwanis Community Park. The Sister City Garden is available for everyone to enjoy and include a ramada where special events and ceremonies can be held. More than 600 plaques line the walkway leading into the Sister City Garden, marking the footsteps of our student delegates who eagerly and courageously dared to participate in cross-cultural exchange and build friendships with their peers in our sister cities. Each plaque displays the names of both the Tempe student delegate and their sister city host side-by-side, symbolizing the friendships built during the exchanges. As you walk down the path toward the gardens, you’ll walk through time: The first plaques bear the names of the Tempe students and their Yugoslav counterparts who participated in the first exchange in 1973 with our first sister city, Skopje, which is now part of the Republic of Macedonia. Upon nearing the garden, you’ll find the names of the most recent student ambassadors who travel not only to Europe but also to Asia and South America and of their new friends who’ve come to Tempe as well. There are similar plaques commemorating the professionals and educators from Tempe and our sister cities who have also boldly crossed cultural divides to learn from one another and grow to call each other friends. What other activities are available in Kiwanis Community Park? Feel free to pack a lunch to enjoy in our picnic area and explore the park after your garden visit. Kiwanis Community Park is open to the public and offers many recreational options including several sports fields and a public pool. Tempe Sister Cities couldn’t have asked for a better location to recognize publicly the fabulous people associated with our organization than a open meeting ground where people can gather and friendships can grow. Would you like to read about the Tempe Sister City Garden and other Tempe Sister Cities activities? Receive our Tempe Sister Cities email newsletter to hear about the latest events and happenings.